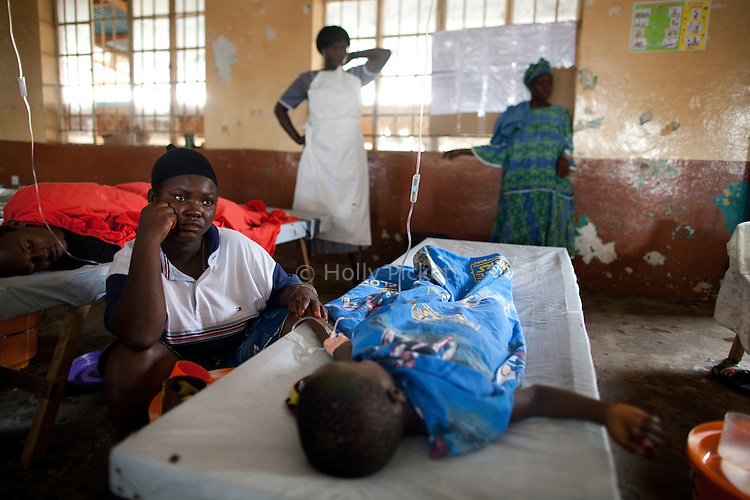 Sia Yabom Bangura sits at the bed of her 5-year-old son Aliou Kamara at Wellington Cholera Treatment Center, Freetown, Sierra Leone, Aug. 14, 2012. Médecins Sans Frontières Belgium, in collaboration with the Sierra Leone Ministry of Health, is running four emergency cholera treatment centers to keep up with the number of patients. Many of the roughly 120 daily patients seen by the MSF team come from extremely impoverished areas of the densely-populated capital, where proper systems for drainage and waste disposal are almost non-existent. Outbreaks of water-borne diseases like cholera become even more likely during the rainy season, which is expected to last at least two more months.